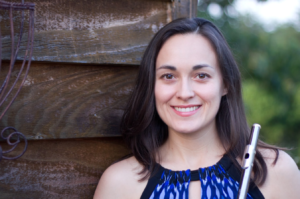 I am a professional flutist, so I perform with the Augusta Symphony and Long Bay Symphonies (Myrtle Beach), and I am professor of flute at UNC Chapel Hill. I first started teaching flute lessons 18 years ago! This is my 11th year teaching in the classroom and my 9th year teaching online (all 9 with NCVPS). Do You Have Online Experience as a Student? Yes, but they were very different from online classes today! I remember taking one American History class in college that was a brand new 100% online course…basically, at that time, “100% online” meant that the professor emailed reading assignments and a series of essay questions based on the readings that were due back (via email) at the end of the week. There was no way of taking an exam online at that time (no Blackboard or Canvas! ), so I had to take a paper and pencil test with a proctor at the local public library. The best advice I can give is to stay in communication with your teacher via text, email, and through the daily course messages and Announcements. Youtube.com is one of my favorite resources! I can find resources for music theory or recordings of flute pieces I’m learning. I’m also a big fan of the “unlisted” feature where I’ve loaded several of my own videos to share with specific people. Of course, I love my laptop, iPhone, and iPad (especially for the recording video and audio apps), but I’m also a big fan of GPS technology. Before Google Maps, you would have to go to AAA to get a physical map and there was limited information on it about places to eat, gas stations, rest stops, etc. With GPS on our phones, the route preferences and points of interest searches are nearly endless! One of my goals was to exercise more. I was successful in doing more yoga each week and I was able to get on our stationary bike more often (we have a laptop table on the bike so I can exercise while I grade NCVPS assignments! ), but now, I’d like to get more outdoor activity in my day too. I think my favorite books would be the Harry Potter series. I love that e-books are so portable, but there’s something that I prefer about having a tactile book in your hand and reading cover to cover. I’m not sure that I have a single favorite song (being a musician, it’s hard to choose just one! ), but I have several favorite composers. If I had to name one, I think I’d have to go with Georgian composer Otar Taktakishvili. He’s not as well-known as other classical composers, but his style is similar to Bela Bartok, with lots of Eastern European tunes and folk themes. The second movement to his flute sonata is hauntingly gorgeous….I could play it all day! Again, this is tough…I don’t get to watch much TV with my schedule. I like shows with sci-fi and time travel themes. Two that come to mind are Eureka and Warehouse 13. My husband is also a musician (he’s a violinist) and coaches Japanese with NCVPS. We have a 2-year-old daughter who keeps us VERY busy! I love to travel and have performed in North America, Europe, and Asia (I’m always looking for opportunities to perform elsewhere too). I went to grad school in England for a year at the Royal Academy of Music in London. And, I’ve been to all 50 states except Hawaii, Montana, and Maine. I think that online education is going to be an integral part of the future of learning. In the last 20 years, I have seen live classes run via satellite to college online courses run without LMSs (Learning Management Systems) to entire public schools like NCVPS running a full schedule of courses through elaborate programs like Canvas. I expect that in the next 20 years, online learning options will become the norm as part of a K-12 education (as it almost is in higher education now), and that students will have even more options available to them in terms of flexibility of course schedules, variety of subjects offered, and level of advancement of the subject matter. Scheduling was tough for me in the beginning. At first, I was also teaching face-to-face when I started with NCVPS and my tendency was to work all hours of the night on my classes. While there are deadlines to be met, I have found that I am more productive and a better quality teacher if I make specific hours that I can keep for NCVPS work. The work is almost never done (especially with communication! ), so finding a way to complete the work in a timely manner that also gives me some down time each day is really the key to being happy as an online instructor. The other tip is to plan for more work at the beginning of the semester that will ultimately help alleviate some work later in the semester. For example, I use GroupMe for all of my courses. It takes more time at the beginning of the semester to set up each GroupMe group for my different classes, but it saves TONS of time later when I need to communicate quickly with all my students and can send a synchronous message in seconds. Work smarter, not necessarily harder.